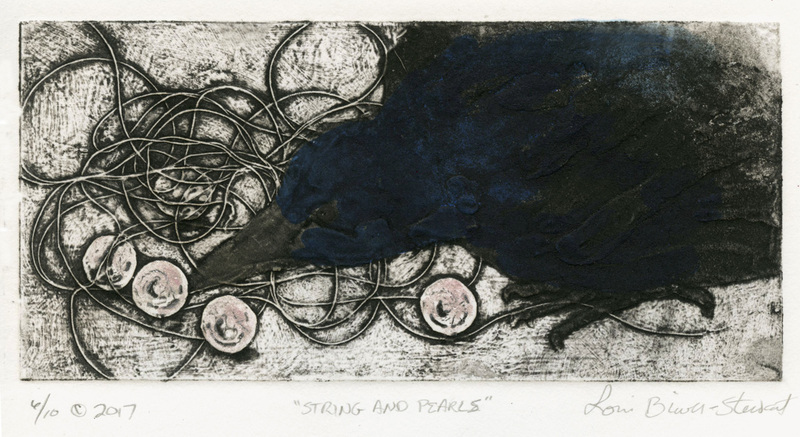 "String and Pearls" is an original Collagraph print of a curious crow (or raven) investigating string and some discarded pearls. The crow has some blue overtones that was hard to pick up in the photos. I used carborundum to get the rich black of the bird. The plate was made by applying thread, lightweight paper, carborundum, and glue to make a relief plate. The surface is then covered with ink, wiped off by hand, and then printed onto damp Stonehenge printmaking paper with my press. This print is shipped flat. It's mounted on a piece of archival foamboard and is packaged in a clear sleeve for protection. When matted it would fit perfectly into an 11 x 14 frame.